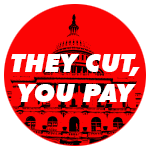 More than 700,000 federal government employees will experience up to a 20 percent pay cut due to forced furloughs. Are you an AFGE member affected by furloughs? We want to hear from you about how furloughs are affecting your family, your life, and your community. Please click here to share your story with us and have your voices heard. Please be sure to include your name, location, the federal agency you work for and your AFGE local number. So many of our members have shared their experiences and we want to hear from YOU! This entry was posted in DoD, EPA, Fight Back, HUD and tagged furloughs, sequestration. Bookmark the permalink.